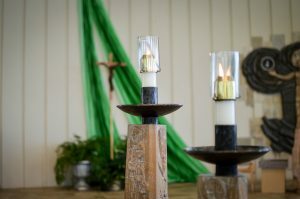 Home › I BLOG › Immaculate Conception: How can this be? Immaculate Conception: How can this be? A sinless Virgin Mary? No matter how many times I hear it, on this Feast of the Immaculate Conception, my rational mind struggles once again to come to terms with a belief that was widely held, but only became official doctrine in 1854, through a proclamation by Pope Pius IX. The readings for the service today at the Mystical Rose Oratory do not make it easier. What are we to make of a surprise visit by the Angel Gabriel to a wonderfully composed Mary? Yes, we are told she was “greatly troubled,” but really, she should have been in meltdown. Here she is, a young girl in a remote village, without power, status or learning, being told by a heavenly messenger that she will conceive a son, thanks to “the holy Spirit: which “will come upon you, and the power of the Most High will overshadow you.” Heavy stuff. This is not ordinary news. It is the kind of news that would break lesser mortals. But Mary, this unschooled young woman, surrenders to it with calm acceptance. And grace. And perhaps that is all this feast is about. The extravagance of grace. The need to be ready to receive it when it is sent our way. The need to accept the “Other”—whoever he or she may be, as celebrant, Fr. 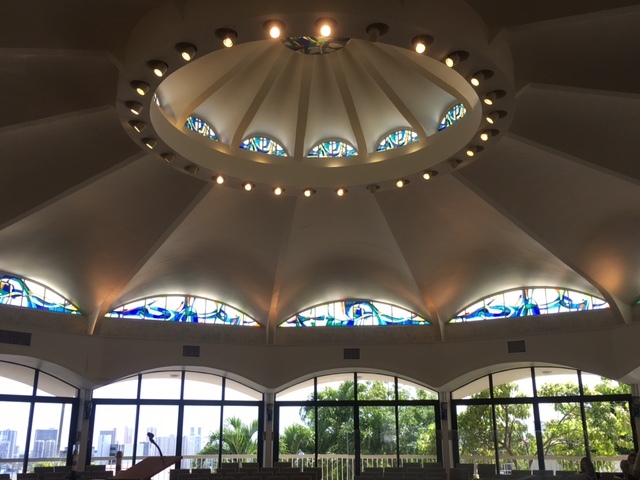 Paul Fitzpatrick pointed out in his homily at the Mystical Rose Oratory today. He might be an Angel. Or she could be an immigrant. Or a juvenile offender. Or any number of other people who cross our path or come to us via our television screens and social media. But do we have the eyes, the heart and the head to see Jesus in the desperation of the Rohingya fleeing Myanmar, a land that they have long called home, even as the nation refused to acknowledge their presence? Will we see him among the Palestinians driven from their ancestral lands, their homes and olive trees destroyed by settlers, their daily lives policed in every way? How do we begin to find him in the North Koreans, trapped in a land that has kept them isolated from the rest of the world? In this time of great brokenness, we are reminded of the capacity we each have to repair that brokenness that we encounter wherever we are. We are reminded by Mary of the grace of simple acceptance. Mary is the original grassroots citizen. She makes no claims for herself. Yet she is extraordinary in her willingness to let herself be an instrument of events that will change the course of history. We need to remember that our world today is not without hope when there are so many Marys working quietly, unfazed by power, whether it is manifested by the wings of an archangel, or the wings of Air Force One. Mary takes the world as it is handed to her and becomes the bearer of the Word that will become man. Perhaps the Feast of the Immaculate Conception is a reminder that we cannot stop trying to respond with the kind of trust and willingness Mary demonstrated. So that we too might recognize the Divine, not where princes play and the powerful exert their sway, but where there is no power except the power of faith. And grace. Unlooked for. Often undeserved. Yet always there, without stipulations. Yes, grace. But only if we can somehow surrender as simply as Mary did. Thanks for this lovely post. Perhaps because my child-mind was so connected to the many miracles I heard of as a young Catholic, I’ve NEVER had doubt about Mary’s sinlessness, though of course as we grow “rational” I do understand people doubting the annunciation and other such tales. I loved the story of her rushing off to visit Elizabeth because the angel told her of her old cousin’s pregnancy, much like old Sarah’s and the long barren Hannah and Rachel. I took Mary as my confirmation name because what else would I take? Beautiful young Dominican nuns had inducted me into a deep belief in her and her Son with practices like envisioning each rosary mystery (not just saying the rote prayers) and “visiting” Jesus in the tabernacle and talking with Him. It was pretty lonely I imagined, sitting in that golden ark all day. I’m so grateful for my belief and I’m grateful for Pope Francis pushing us to see GOD in the Rohingya. I see him in teens in my area kneeling to show we must wake up to internalized racism and stand against the way it still poisons our country. I see Spirit each day in many elders and children struggling with life yet finding moments of grace. I love that your priest pushed you to see that ANGELS show up in so so many people and circumstances. I can count many times I felt a guardian presence keeping me from harm – or it was Spirit overshadowing me. However we name it, our deep belief in Mary is powerful. On today’s feast of Juan Diego, now a saint, meeting her at the hill in Mexico, we are reminded she is watching over us as she did at Fatima, at Lourdes, at Knock and in more places than are ever celebrated. I so appreciate your words. Thanks for this enlightening post on the Immaculate Conception. I found it quite refreshing. Love this post about why we need to accept with willingness & trust the situations we find ourselves in and the promise of grace in expected places..”In this time of great brokenness, we are reminded of the capacity we each have to repair that brokenness that we encounter wherever we are”. Amen.